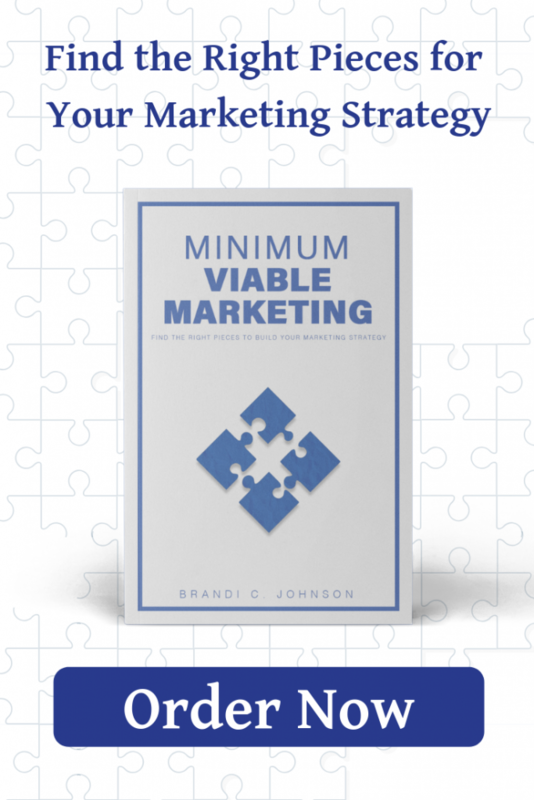 When I started Minimum Viable Marketing writing several months ago, I had just finished reading The Life-Changing Magic of Tidying Up by Marie Kondo for the third time. I had a note sitting on my desk that said “Konmari Your Marketing” – because that’s exactly what Minimum Viable Marketing helps you do. While it didn’t make the final cut for the book, I wanted to make sure I shared the inspired-by framework with you. We can apply these same rules to the marketing of your business. I know many business coaches, marketing advisors, and consultants will push you to be on every platform to market your business – from Facebook to Pinterest to YouTube, even when it doesn’t make sense to reach your audience or align with your goals. 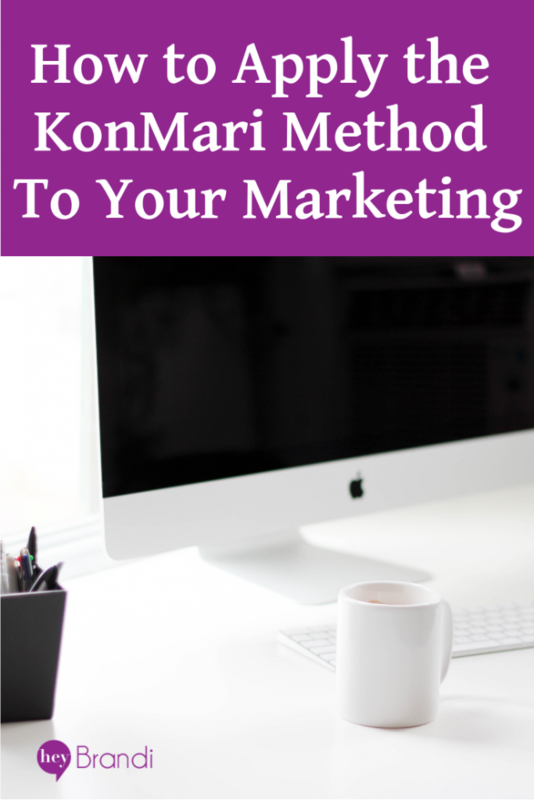 Commit to simplifying your marketing. Imagine your ideal marketing mix. Follow the right order (website, email list, amplification channels). Rule 1: Commit to simplify your marketing. The first rule is actually the hardest – because it means that you’re going to stop doing some of your marketing activities that aren’t growing your business. You’re going to say no to some opportunities. You’re going to have to tune out all those coaches and gurus and course creators that are trying to convince you that you need to add one more platform to your marketing plan. You’ll make this commitment every day – sometimes twice a day. Whenever that shiny object syndrome raises its ugly head, maintain your commitment. Rule 2: Imagine your ideal marketing mix. Now that you’ve committed to simplifying your marketing, the next step is to imagine what your marketing mix looks like. What types of content do you enjoy creating? Are you a video enthusiast? Or do you prefer to focus on the other side of a keyboard? Is your brand driven by powerful images or the power of a community you bring together? Imagine what those key aspects of your marketing look like – the ones you look forward to creating and engaging with, rather than the things you dread. Rule 3: Measure first, cut second. Now that we know what you love, and what you want in your mix. It’s time to spend a bit of time measuring what’s working now. Look at what’s driving you traffic, conversions, and – most importantly – sales. Before you decide what goes to the chopping block, it’s important to know what’s working, and what’s not. Rule 4: Tidy by category. Now’s the time to start cleaning up your marketing strategy. Start with your website – the digital home of your business. Make sure that it’s clearly communicating to your ideal clients who you are, what you do, and how they can work with you. Then, move on to your email list. Make sure you’ve got a great reason for people to connect with you, and a calendar for when you’re going to send messages, and what you’re going to send when you do. Finally, get focused and consistent with your two key amplification platforms. That means – yes – that you’re only choosing TWO places that you’re focused on engaging with your audience. That might mean you’re on Instagram and Pinterest. Or using LinkedIn and Google Adwords. The mix you choose is based on your business goals and ideal customers. In the last rule, I shared the four key pieces of your marketing strategy and suggested that you tidy them up by category. The order that I listed is very important too. Your website is the digital home of your business – it’s your storefront and the key impression that you leave with people. If your website isn’t right, then it doesn’t matter how good your social media posts are or your ad campaigns – you’re going to struggle to convert customers. After you’ve nailed your website, it’s time to get started on your email list. Do you have a strong call-to-action? Do you email them regularly with good content? Do you actually invite them to join your list in several places on your website? Let’s be honest – it doesn’t do you much good to get them to your website if you can’t get them back to make the sale. Finally, after you’ve got those two buttoned up, nice and tidy, then it’s time to get your amplification platforms. Turn on the lights and throw open the doors, the party is ready to start! This rule is at the heart of the KonMari method. With each item, as you sort, you ask yourself “does it spark joy?” If it doesn’t, then you thank the item for its service, and let it pass into a new home. The same should be true of your marketing. Sure – marketing will always be work. But it should also bring you joy. You should find some element of pleasure in creating content, watching your follower counts or clicks grow, and connecting with new customers. But the key to great marketing efforts – and great marketing results – is consistency. And we struggle to be consistent with anything that we dread. That dragging-your-feet feeling is going to show up in the quality of your messages and the consistency in which you share. When you’re tidying and making all these decisions about your marketing, ask yourself if you’re enjoying what you do. If not, let it pass to a new home. You can shut down a platform. Repurpose it. Or if your business can’t go on without it – hire someone to do it for you. So that’s it – how I apply the KonMari method to marketing. If you’ve already KonMari’ed your marketing, or are going to, I’d love to hear about how it goes. Share a comment on the blog post, connect on Facebook, Instagram, or LinkedIn.